38th volume out june 24. From this volume, cover will have new design. And look like will have a reimpression of old volumes with this new cover design. More information in Young Animal #08 (april 8). Thanks for the info. I wonder what the new cover design will be like. That also means us old timers are going to have vintage volumes eventually, when the new covers are widespread. That's... not better than the old design. 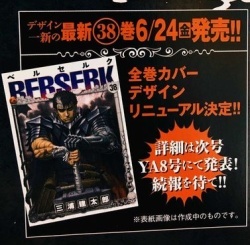 Also, random Guts pose on volume 38, who'd have thought. EDIT: Man, I can't get over how cheesy this new design is. It's like something straight out from the 80s, from an old Dungeons & Dragons manual. The little skull, beherit and brand in the corners... The vines on the "columns"... The smoke on top and the little wings in the middle that, in the first cover to ever sport this design, just so happen to come from each side of Guts' head, making it look ridiculous. I'll be the first to say the cover design could have used an overhaul, but who in hell came up with this thing? It's like a step back from the old one. As always, I expected more from the cover art. A bit of a disappointment that such a Falconia focused portion doesn't get represented on the cover -- instead, another arbitrary Guts pose. And the redesign, my biggest problem with it is that it feels cheap, and done by someone not very familiar with the series' overall style. The columns around with vines seem nice ... kind of remembers Dark Souls - no idea why - but it seems fit as it resembles Falconia. But, the smoke and behelit around his head really don't seem to fit, feels like pretty generic and uncreative. It Could really be something else related to Falconia, giving the impression Guts would be there somehow, someday, or not. Would be cool and fitting one way or the other. Maybe 2 tiny of those hoplite statues of the city would be cool, but a greco-roman aesthetic is just about great.But I agree with Walter on this, the city definitively could be focus; reborn Femto or Skellig also are nice alternatives. Seems the intent on remaking old covers is a good idea, however, this one didn't end up well. Everything made of metal: Berserk armor, gauntlet and Dragonslayer have the same kind of opaque, blueish finish. That just doesn't fit to me. The arm and sword are made of iron, which is black, and the armor for all we know is pretty much black as the abyss. I hope Dark Horse will adapt the new Berserk logo at least, their current font is awful. Happy to have a release date, thanks. But I agree with what has already been said about this new design, I don't really like it either, the current design appears to be more modern than this one. Nonethless there is still the 2- sided Poster inside the volume, hope we get some nice Illustrations involving Silat & the Tapasa. Edit: And it was SO obvious that they would release this Volume around the time the new Anime starts, to once again promote the anime series. Just makes me think more and more that the monthly shedule was used to match the announce date for the new anime series. I don't think there's any doubt of that. I still don't have a Japanese set, but now that I see the new design, I'm going to have to get the original 1-37 before these new editions become ubiquitous. And thanks again Heiji! You always bring good news! Same here! I only have 4 volumes in Japanese. I'll have to rush to get them before they reprint the older ones. As for the visual, I don't know why but that one reminds me of volume 27 cover. I'm having a hard time seeing the picture right so I'm mixed between liking the new design and not liking it. Not only I disliked that artwork the first time it appeared in Young Animal, but now, they are using it for volume 38... His oldest artworks were so much better. And that new cover design... seriously... why do they have to change everything for something so horrible..? I don't get it. Very Very Disappointing....i don't mind the new guts illustration as much as others but don't think it should be the face of the new volume but like mangetsu said, at least we still have the double sided posters...and they better be good. I'm actually fine with the new volume design, doesn't bother me at all and its cool that they're reprinting the older volumes with the new style so the consistency stays. can't say that for every manga that changes volume style at one point. i wonder how foreign publishers will take this, i own the Glénat berserk set which has a very close design to the original Japanese design and Glénat have been doing ALOT of berserk reprints lately spanning across every single volume, i wonder if they'll use this design going forward or just add the guts illustration to their current design. if i remember correctly, DH is also coming out with an omnibus edition of berserk sometime in the future, if so PLEASE use this instead of their current design which is trash, especially the logo. at least we still have the double sided posters...and they better be good. My hope: Rakshas hovering over the beheaded statue (of Gaiseric!) & Daiba feeding cheese to a swarm of rats. Honorable mention: Locus crushing the ledge in anger. Puck Vs Albatross dramatic reenactment. More likely: Griffith staring emotionlessly off the balcony (at Rickert). Tea party. These, along with the little image insert on the dust jacket, are my favorite parts of new volumes, since the covers have been disappointing to me for years. I think it's the same for most of us. I actually like that illustration, it's pretty neat if without surprises as far as depicting Guts goes. But it's just not appropriate for that volume. Thing is, from a marketing perspective I can't really fault Hakusensha for pushing Guts forward everytime. It's what sells to the masses. I just wish that was not a factor. I'd be surprised if Rakshas wasn't featured, given his central role in the volume. Oh boy, I don't know what to feel about this cover. I agree with the others though, the cover doesn't match the contents of the volume at all. I wish they didn't make a new design. I was planning to eventually collect all the original Japanese volumes too, but now I don't know if I should wait until they reprint all of them first. The way my mind is wired, I like consistency. It would drive me nuts to have a collection that looks different starting with Vol 38. Puck Vs Albatross dramatic reenactment. And I'll add that one representing Molda flying with her broom wouldn't surprise me, introducing the new character. Except if episode 343 isn't featured in. Except if episode 343 isn't featured in. I can't imagine it'd be left out. That being said, there hasn't been a volume with 10 episodes in a while, but there's no reason NOT to include 343 this time just because of that dogma. I'll go against the grain. I like the new borders a lot more than the old style. What I do hate is that volumes 1-37 are going to be different on the shelf from 38 onward. OCD nightmare. However, the choice of Guts is disappointing and his placement in the frame is a bit odd. Smoke out the ears, indeed. The new design is indeed GROSS. The old one was antiquated and could use an update but at least it was relatively clean. This is more like a downgrade. Higher quality image of the new volume cover. Thanks for the picture, Patrick. It's interesting that they removed the little wings at the top. Probably looked too ridiculous, even for them. This is still super cheesy though. I wish they'd have a change of heart. Another thing is the publisher is now Young Animal Comics. I guess it makes sense to have renamed it from Jets Comics after all these years, but I'll miss that little dino. Also, what's the point of having intricate artwork on the cover if you're going to put permanent text over it (publisher's name over the art in the lower right corner)? It's just bad design. The only thing I like is what they did with Miura's name. Thanks, it's not as bad as I thought. But is this a bat at the bottom of it? That border still looks like a hodgepodge of Berserk-themed clip art.